Hello, my name is Wesley Ogino. Oxford, Pennsylvania is a small town in southeastern PA that I call home. To give some perspective on where Oxford resides, I can leave my home and be in Maryland in five minutes, or be in Delaware in fifteen minutes. I am a freshman in the Division of Undergraduate Students, trying to find a major that actually seems interesting. I have the motivation and want to do big things, but I’m just waiting for something to really catch my eye. In my free time I really enjoy to snowboard. I’ve been snowboarding since I was just a wee lad at four years old. The sport gives me a reason to actually look forward to the temperature being under 32 degrees. There is a science behind snowboarding that I do not comprehend, even though I put it into action every time I head down the mountain. Here, I learned how snowboarding works in the eyes of someone who knows their physics. Now you can learn too. To me personally, they just made snowboarding sound too complicated. Why didn’t I become a science major? Maybe, it’s because I took biology my freshman year and absolutely hated it. Maybe it’s because I had chemistry my sophomore year and I also hated it. Science has never appealed to me…at all. I’ll be honest, I didn’t even give physics a shot. Oh, and I forgot to mention that I’m pitiful at math. The often present correlation between math and science scares me away from any major that would require me to be adequate at both. I wish I was a genius when it comes to these subjects, but unfortunately I was not blessed with a math and science brain. So, here I am in SC200. At NSO, the adviser who aided me in the course selection led me to this course. While looking for a General Education course, the adviser basically shot down every class I considered taking because he knew it wouldn’t interest me enough. Finally, he told me to search for this class and read the course description. I was set on taking SC200 as soon as I learned what it was about it. I’m very excited for the topics we will be covering, as just reading through the schedule had me intrigued. I can’t wait to see the entirety of what the class holds in the future. 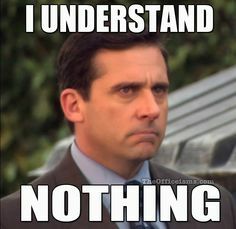 I am a huge fan of The Office, so here is Michael Scott showing what went through my head when I looked at my first chem test in high school. And here is a link to various “Science for Dummies” instructional books. If you’re anything like me, they might come in handy. This entry was posted in Uncategorized on August 31, 2016 by Wesley N Ogino. Hi Wesley! I’ll tell you know that you probably would not have liked physics. The only reason why I liked it was because of my teacher. Easily the hardest class I have ever taken. Although, there was one question that I particularly enjoyed that went along the lines of: A car is slowly rolling at 1 mph towards a group of small children. Yo have just enough time to drive your car into it and save the children! At what velocity should you crash yourself into the vehicle to stop it? I love that question so much. It is so ridiculous. Just picturing a car slowly roll towards kids and instead of yelling at the children to move before it maybe gently knocks them over, first instinct was to crash the car with your own. Physics was extremely confusing to me, and so I to look forward to having in-depth conversation and debates rather than math.